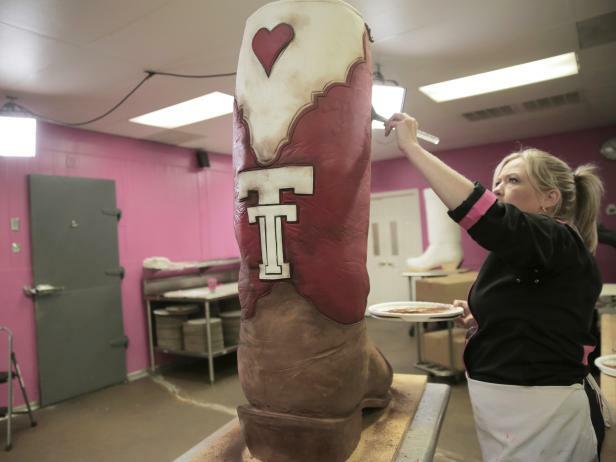 Everything is bigger in Texas – even the cakes! Beginning Monday, April 30th at 9:30pm CST, Food Network viewers will follow the best Dallas-area bakers as they transform their clientele’s wildest imaginations into extraordinary customized confections. In each of the 10 half-hour episodes, three outrageously talented bakers conceive, create and deliver incredible, edible works of art using cake, frosting, incredible imagination and skill. From an impressive Game of Thrones wedding cake featuring an intricate cake topper of a dragon wrapped around the iron throne, to a Back to the Future DeLorean car cake with working headlights, and to a gigantic oil derrick cake that spews chocolate, these Dallas Cakes are always top tier. Dragons and Belt Buckles, Oh My! A groom’s cake with a Game of Thrones theme isn’t complete without a sculpted ice dragon and an intricately carved Iron Throne. The ultimate block party celebrates Chinese New Year with a cake so over the top it literally smokes. Then, to commemorate the 100th anniversary of the Fort Worth Stockyards Championship Rodeo, 24 layers of cowboy coffee cake are turned into the world’s largest belt buckle, and the real question is whether it will hold up to being delivered right to the arena floor. Next Next post: Sushi Marquee attempts world record for largest group sake bomb and you’re invited!